After all the weird critters we have recently unearthed, this one is easy. An over sized eagle with easy to catch large land birds is a pretty creditable ecological niche. That it picked off the odd human child is no surprise. That man likely hunted it to swift extinction is a certainty. The feathers alone would cause that. The bird also had no place to hide. It would be spotted going to its nest and be easily vulnerable. 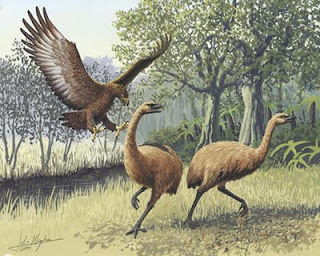 This also suggests that such large birds might have existed once globally until mankind showed up and took an interest. Or perhaps this bird was unable to fly the distance to reach Australia and it is locally unique. The one observation that we can make is that large predators require similarly sized prey that is readily available. This was true for Pleistocene mega lions and cave bears. Once the big ones were driven to the wall they followed. A massive man-eating bird of prey from ancient Maori legend really did exist, according to new research. Scientists have known about the existence of Haast's eagle for over a century based on excavated bones, but the behaviour of these giant birds was not clear. As the eagles weighed up to 40 lbs some scientists presumed they were scavengers rather than the predators from mythology. But a new study has revealed the eagle as a fearsome predator that probably swooped on flightless birds and even children from a high mountain perch. Researchers Paul Scofield of the Canterbury Museum in New Zealand and Ken Ashwell of the University of New South Wales used computerised CT and CAT scans to reconstruct the size of the brain, eyes, ears and spinal cord of this ancient eagle. This data was compared to values from modern predatory and scavenging birds to determine the habits of the extinct eagle. Professor Scofield said the findings are similar to what he found in Maori folk tales. 'The science supports Maori mythology of the legendary pouakai or hokioi, a huge bird that could swoop down on people in the mountains and was capable of killing a small child,' he said. The researchers also determined the eagle quickly evolved from a much smaller ancestor, with the body growing much more quickly than the brain. They believe its body grew 10 times bigger during the early to middle Pleistocene period, 700,000 to 1.8 million years ago. 'This work is a great example of how rapidly evolving medical techniques and equipment can be used to solve ancient medical mysteries,' Professor Ashwell said. They wrote their conclusions in the peer-reviewed Journal of Vertebrate Paleontology. Scientists believe the Haast's eagle became extinct due to habitat destruction and the extinction of its prey species at the hands of early Polynesian settlers. Before the humans colonized New Zealand about 750 years ago, the largest inhabitants were birds like the Haast's eagle and the moa.